I love the boiler suit and everything it symbolises. I personally feel wearing a utility style boiler suit shows off the hard working and ambitious females we all are. And that women can take on any 'mans job' as Fuchsia Shaw the amazing brand behind this boiler suit says. 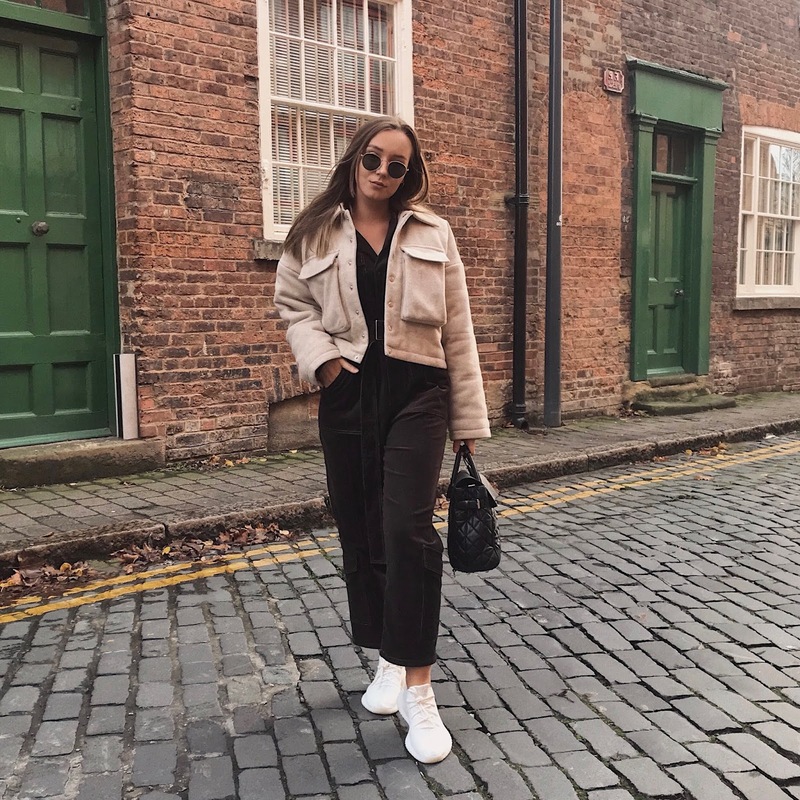 I was inspired to write this blog post after reading this months Vogue and seeing a headline "Down tools, the effortless, powerful style, there's nothing like a boiler suit". I purchased this boiler suit towards the end of last year so it isn't a 'trend' I have been following or styling too often, yet. I spent several weeks justifying, and making sure I was investing my money into the right piece this season. As you may know, I am trying to be really cautious with what I buy, how much, and how often I purchase. It really is something, especially as a fashion focused student, I want to have a better understanding of (maybe a blog post coming soon??). This boiler suit designed by Amy for her amazing brand Fuchsia Shaw (that I think I will be forever obsessed with) is a tribute to working women's in WW2 coveralls cutting the shape with femininity in mind, tapering the leg, clinching the waist but keeping those practical details with chest and leg flap pockets (A personal favourite of mine). Here I have styled this boiler suit wearing white trainers as well as my Fuchsia Shaw quilted wool jacket (told you I was obsessed). 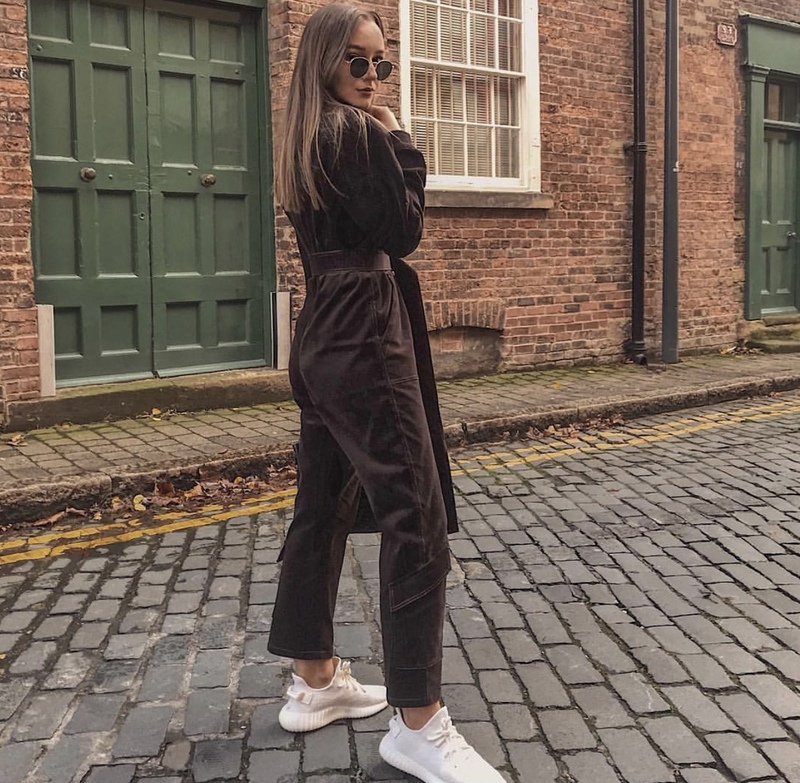 A boiler suit is so versatile to style up or down. 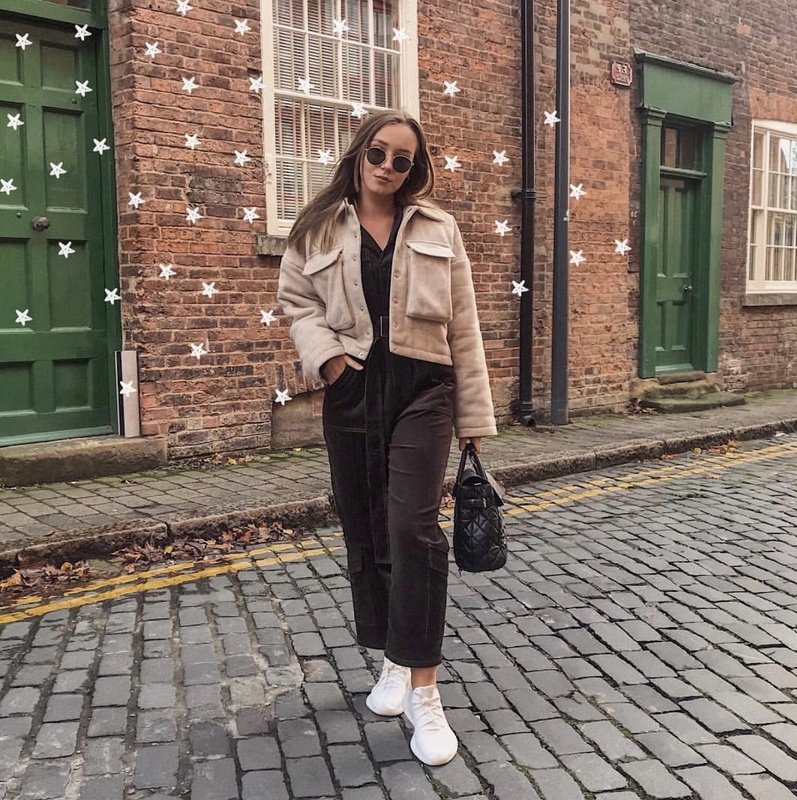 I love this boiler suit with chunky trainers and a light coloured turtle neck underneath, all the way to high heeled boots and contrasting coloured bag. 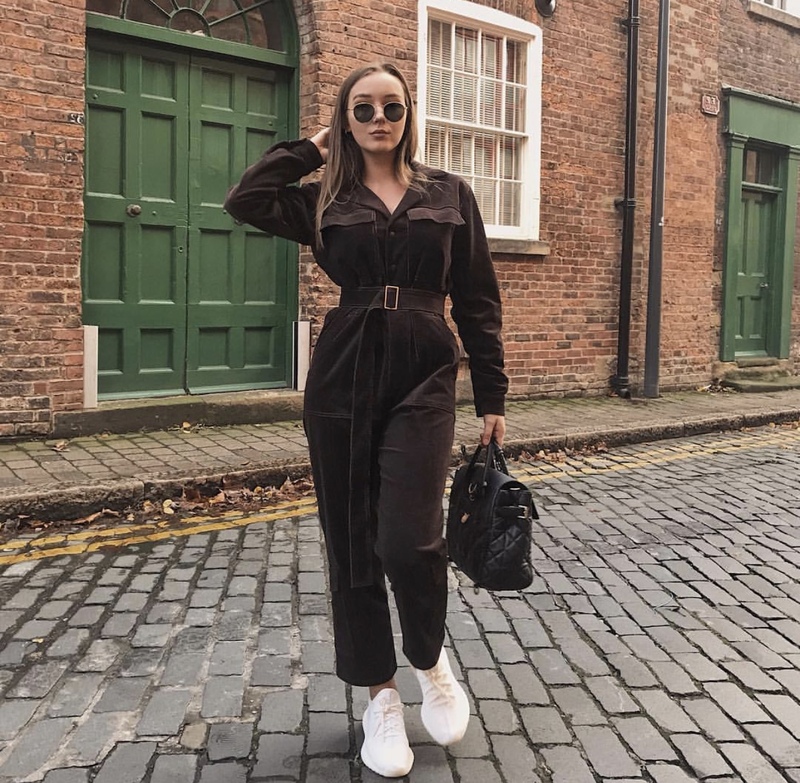 Although this boiler suit has now been sold as only a limited amounts are made, there is so many alternatives on the high street as well as high end. Personally, I think I would invest in one for Winter and one for Summer as the fabrics are often very contrasting and I can imagine this cord fabric won't work too well on a hot summers day. However, a light linen boiler suit with the similar idea of chunky trainers (I am not leaving the chunky trainers trend just yet) would work really well. What do you think about boiler suits? Do they make you feel as empowered as they do me? Click here to check out Fuchsia Shaw. Wow what a year! I can't believe we are at the end of another year again. It only seems like a few months have passed since I wrote a blog post similar to this last year. It has been a crazy year starting second year of University, travelling on holidays, working with new brands and new companies on exciting projects and becoming a Boux Avenue Student Ambassador. So similar to last year I thought I would do '18 highlights of my 2018', I loved looking back at my 2017 and remembering everything I was proud of, a really good idea for reflection in years to come. 1. Finishing my first year at University with overall First (wish it was included in my final grade!). 2. Creating my first tailored jacket, a piece I was really proud and happy to have finished. 3. Becoming a Boux Ambassador, I had known about the scheme for nearly a year and was so desperate to work with them. 4. Re decorating my room exactly how I wanted (small but I really love it now). 5. Buying my first Vivienne Westwood Dress, I had awed over these for such a long time. 6. Getting a job at Sandro in Harvey Nichols, even though I am now leaving to focus more on University, I was so proud of this moment, a big step up from Topshop! 7. Three of the most amazing holidays ever with Jack, Grenada and Amsterdam were two of my favourite places (and very different). 8. Celebrating two years with Jack in summer and our third Christmas together. 9. Managing a 13-hour flight, I wasn't a pro flier and this was a proud moment. 10. Working with so many amazing brands and collaborations like The Body Shop and Danielle Wellington. 11. Visiting the Azzedine Alaia- The Couturier exhibition. 12. Graduate Fashion Week- this was an amazing day and I loved getting inspired and seeing everyone's work. 13. 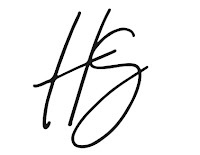 Another year of blogging, still a passion I am carrying on with despite my work load. 14. My 19th birthday with Jack, we celebrated in Amsterdam once my deadlines were over. 15. Snow days! at the beginning of the year we had so much snow and we were snowed in quite a few times, I loved these days. 16. Getting more confident driving, a huge one now I've been driving over a year and it gives me so much freedom, I just love it. 17. Working really hard at University, it has been a struggle in the second year so far but its been a highlight how far i've come, now onto the next term! 18. Discovering my personal style a little more and caring more about what clothes I am buying. It's been a great year and I am so excited for next year as there is so much to come like placement year, which could bring me so many new opportunities, working with different brands and companies and expressing my inner creativity even more! 1. To secure an internship, I really want to do an internship next year and have found this process difficult so far, so is definitely a goal of mine. 2. To carry on working with different brands and companies to help further progress my creativeness and share that on my blog and Instagram. different things that are happening in my life. I've never had my 'go to' products that I use and stick to for years. I have always been that girl that is down to try any new recommendations or 'new in' products I see. However, I have just slightly adjusted my skincare routine and I have been sticking with it for quite a while now as I have really found some good products. I have combination skin that is quite problematic, it never stays the same. Recently, I have been working with the brand The Body Shop and have really found myself exploring into my skincare (and hair care, which also changes with my skin!) and have found some products that I just can't put down and have become my real go to products! A good place to start is removing my makeup and cleansing my skin. I LOVE the Camomile range from The Body Shop, they work supper well with my skin type and dare I say I almost love it maybe even more than my trusty Liz Earle Cleanse and polish. And on the topic of The Body Shop, another one of my favourite products they do is their face masks! I have tried quite a few of these over the past few months and picked out my favourite two for different skin days! My first favourite is the Himalayan charcoal purifying mask which I use when my skin is feeling really congested and oily usually when I have been wearing a lot of makeup for a long period of time. The second face mask I tend to grab is the Mediterranean Almond Milk with Oats instant smoothing face mask. I love this when I am having a pamper night or a long soak in the bath, perfect for balancing my skin out. A new favourite of mine and an essential in my skincare routine is the Tropic Pure Lagoon Blemish Prevention Serum. This product is my new holy grail and has powerful anti-inflammatory properties as well as helps fight skin blemishes. This has helped improve my skin so much, especially during winter when I have been wearing more makeup than usual! Another product I have really been using a lot this winter is the drops of youth serums by The Body Shop. They are super refreshing and infused with plant cells and leaves my skin feeling so soft and fresh, one of my favourites to apply on a morning and after using a face mask. A product I regularly use before moisturiser, after cleansing my face if I am not applying any serums is a toner. Liz Earle Skin Tonic Toner is an all time favourite and I haven't tried many others than this as it really works well for my skin type. One of my favourite products are eye creams/ gels and serums. One of my favourites that I have been using constantly at the minute is the La Prairie anti- ageing eye cream, an expensive one but is also an amazing product. Preventing those eye bags from an early start! Christmas is just around the corner and there is less than a week to get those last minute Christmas gifts in for your friends and family. As many of you know I am a student ambassador for Boux Avenue and incase you didn't know, which I am sure a lot of you don't, I thought I would sum up what the Ambassador Scheme is all about and what it means if you use my code. So to start with, I have a discount code which will change what discount you get every month and this month it is everything Christmas!! which means you can get 20% off with my code 'HANNAHWBOUX20', this covers all aspects of gifting, pj's, underwear, knitwear etc etc! The list goes on and on! I applied to the scheme last Summer and was luckily successful to be able to work with a lovely team of empowering women! I get gifted products every month that fit to the theme of my discount for that month. I don't earn any commission when you use my code it simply just helps me out to potentially win some amazing prizes at the end of the scheme (the internship is top of my list!!) it is also amazing for you guys to get some discounts off amazing products! Now onto the good stuff.... This month is all about Christmas obviously! and we were kindly gifted some extra gifts this month from different brands as well as Boux which was lovely and perfect stocking filler ideas! My Favourite stocking filler ideas are their pyjamas in a bag (essential to have), socks, hand cream and slippers. You can check out all their stocking fillers under £20 here. My absolutely favourite items ever from Boux are their pyjama sets. 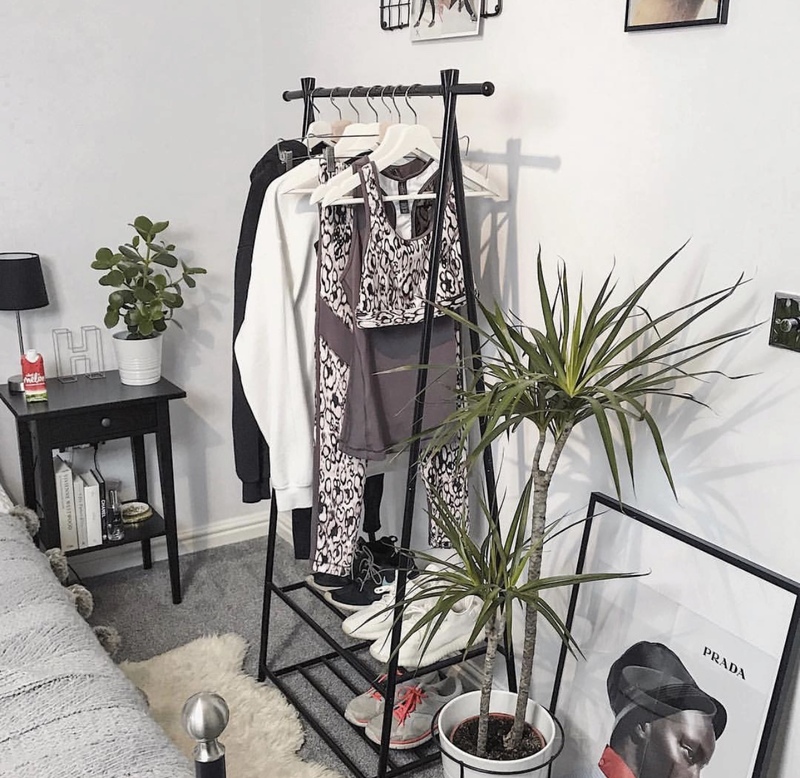 Honestly, my favourites and you can never have enough pyjamas? 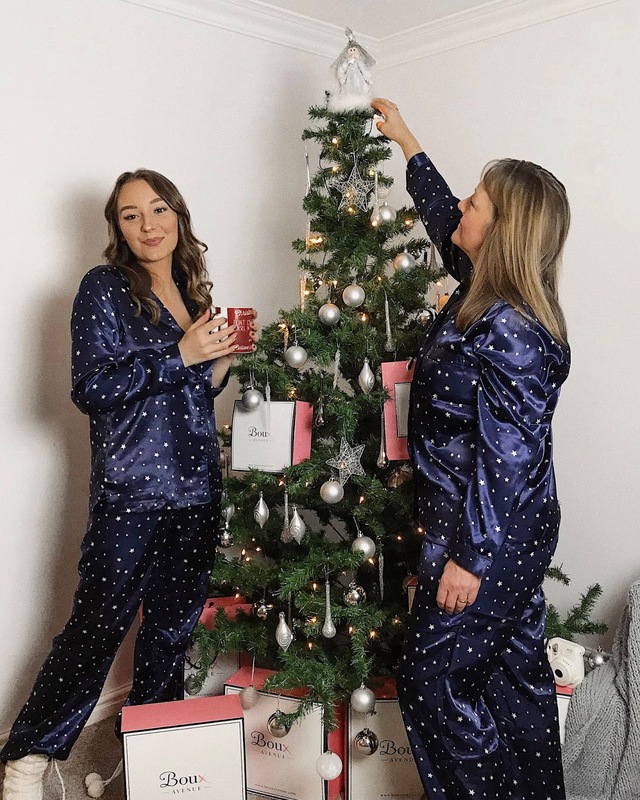 This year Pyjamas have been my go to gift and Boux have some amazing choices this year from shorties in a bag to long silky pyjamas and even festive matching family pyjamas. They also have pyjamas from all different price ranges depending on how much you want to spend. Favourites of mine are their silky satin ones, so soft and perfect for Christmas eve for you and your family! One of my favourites are these star print long satin pyjamas, they're so festive and silky but can be worn all year round. Definitely my Christmas morning pyjama's this year. Another great Christmas present is a robe or dressing gown and personally one of my favourites to receive. 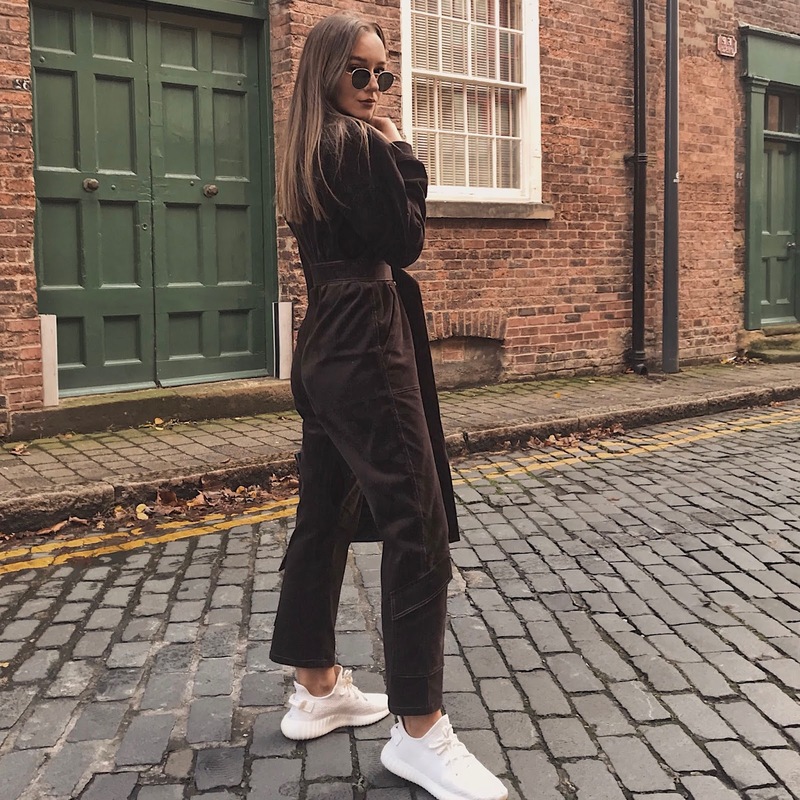 Boux have so may robes and dressing gowns in so many different designs that are so cosy and warm all the way through to the less practical for this time of year but great for summer, the silky satin robes. This Frosted Deer Dressing gown is one of my favourites, so festive too! And the Lace Trim Satin Robe is another favourite of mine. As you may have seen in my previous blog post and on my Instagram stories this year Boux are celebrating the leading lady in your life. This year I am celebrating my mum, who is my leading lady. Why not celebrate your leading lady and as a little thank you treat them to some new luxurious pyjama sets for you both to match in. Don't forget you can use my discount this code this month 'HANNAHWBOUX20' to receive 20% off all Christmas (half the website!!). Also don't forget to follow my Instagram here to keep updated on what discounts you can get every month! You can also use my unique link here, which is just as amazing as using my code if my discount doesn't apply to what you're shopping that month! Thank you for helping me out by using my code and Merry Christmas!